Procter and Gamble quit making it in 2014. More than you want to know (includes a nice 1958 print ad) but I couldn't find out what "GL-70" was beyond that it "fights tooth decay and mouth odor." But it had GL-70, whatever that was! Gee, I feel like I missed out on something - toothpaste that tasted good. 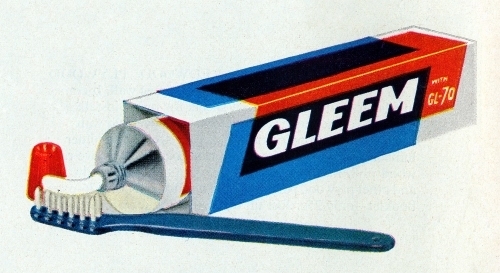 To this discerning palate (lol), Gleem had a distinct and pleasing flavor, unlike the chemical-tasting Crest. And right -- no fluoride. It wasn't really similar to Crest in that it did not have flouride. I remember Gleem, but never used it. Very similar to Crest, eh? We were a Crest family so I guess we didn't miss much. Bah! what do they know? Procter and Gamble said it wasn't all that different from Crest. So they stopped making it.